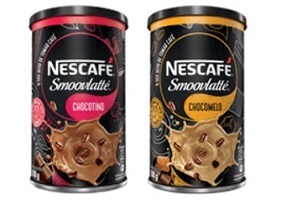 FMCG giant Nestle has introduced a new powdered drink under the Nescafe Smoovlatte brand in Brazil. According to Nestle, the launch is in line with global trends and is aimed at introducing coffee to young adults. The new drink, which marks the entry of the Nescafe brand to the powdered “frappe” category in Brazil, is available in the flavour variants Chocotino and Chocomelo, blending a ‘hit’ of coffee with the flavours of chocolate and caramel respectively. Nescafe Smoovlatte drink powder is available throughout Brazil in 200g canisters featuring a “modern” design, priced at R$7.90 ($2.42). The Smoovlatte brand has previously been used by Nestle in Brazil and other countries for RTD coffee drinks.